In the mid 1850s, as the promise of gold lured migrants from around the world to the newly formed state of California, two Swiss immigrants settled in the Pajaro Valley near the Monterey Bay. In the mid 1850s, as the promise of gold lured migrants from around the world to the newly formed state of California, two Swiss immigrants settled in the Pajaro Valley near the Monterey Bay. This valley, with its mild coastal climate and fertile soil, was perfect for farming uniquely sweet and tart apples. These migrants, Louis and Stephen Martinelli, would make a successful apple crop of their own, and eventually pressed those apples into cider. 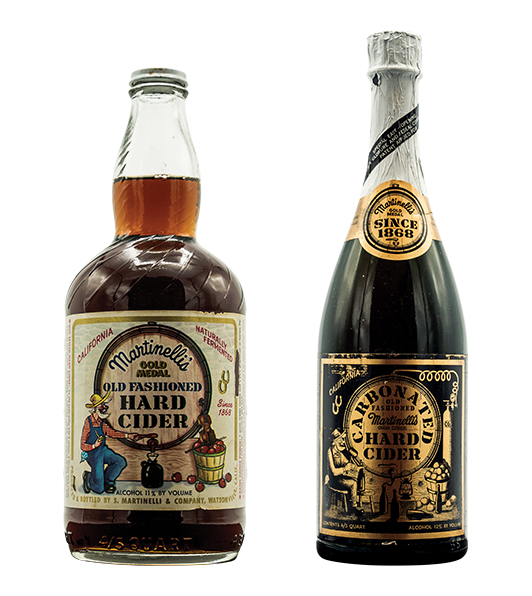 Credited as the first family of American cider, few may know that the first sips of Martinelli’s taken in 1868 were a hard version of the famous sparkling cider and juice we know today. One of the first photos of Martinelli’s Soda and Cider works building, circa 1885. The California Gold Rush brought Louis Martinelli to California from Switzerland, yet he never found any gold. 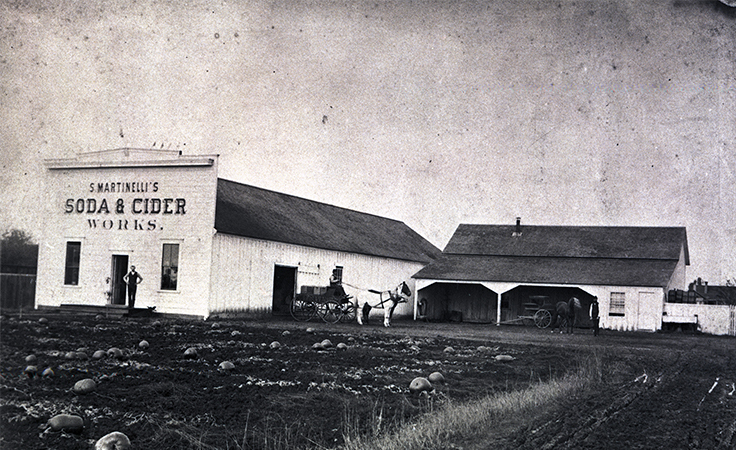 Instead, he established an apple orchard in Watsonville in the 1850s. Soon his younger brother, Stephen G. Martinelli, would join him. Stephen took those apples from Louis’ farm and, using the knowledge he gained making Champagne in France during his youth, created a bottled and fermented apple cider for the people of Watsonville. This officially established S. Martinelli & Co, and it quickly became a local favorite. It also won its first Gold Medal in 1890 at the California state fair. 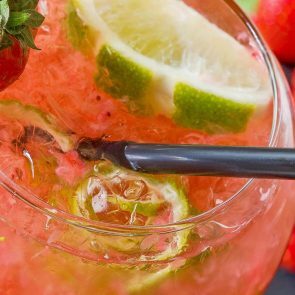 This recipe took a brief hiatus around 1917 when local cities began outlawing the sale of alcoholic beverages, a precursor to National Prohibition. With the blessing of his father, Stephen G. Martinelli, Jr., developed a pasteurized, non-alcoholic version of the family’s cider. When Prohibition officially became a federal law, Martinelli’s had already replaced its hard cider with sparkling and still apple juice. Their hard cider made its return in 1933, when the 21st Amendment made the sale and distribution of alcoholic beverages legal again. This bottle of sparkling hard cider can be dated back to the early 1900s, just before Prohibition became a federal law. 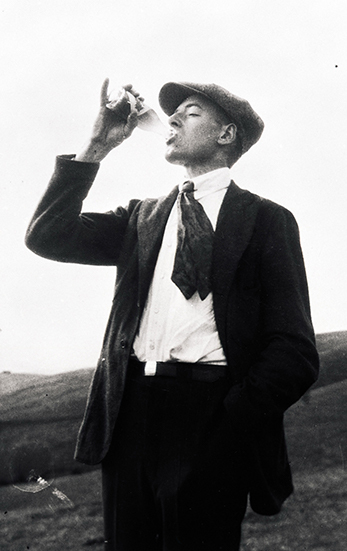 Second generation owner, Stephen G. Martinelli, Jr. takes a drink of what is believed to be one of the first bottles of Martinelli’s non-alcoholic cider, of which he helped create. In the 1960s, Stephen C. Martinelli created a new label for the company’s hard cider with an illustration that became fondly known as the “Old Timer.” This image pays homage to the company’s roots in The California Gold Rush. However, this newly packaged hard cider never became as popular as Martinelli’s Gold Medal Apple juice. By 1978 the hard cider was discontinued permanently, or so we thought! 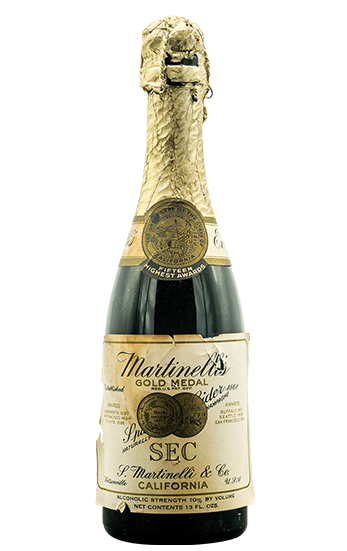 In 2018, to celebrate the company’s 150 anniversary, Martinelli’s decided to commemorate this legacy. What better way than to bring back our historic hard cider product? With the “Old Timer” making his comeback on the label, we made a limited edition called 1868 Hard Cider using our traditional blend of local Pajaro Valley apples. 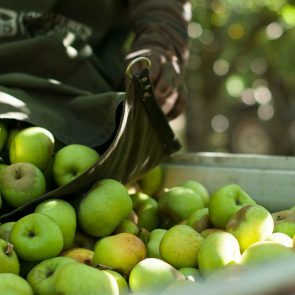 While most hard ciders are made from apple juice concentrate with added sweeteners and preservatives, Martinelli’s 1868 Hard Cider is made from US grown fresh apples that are pressed and fermented with no other ingredients. In October, we entered our 1868 Hard Cider into the Great International Beer, Cider, Mead, and Sake competition in Bridgeport CT. To our delight we won the 1st Place Gold Medal in the Common Cider category. The Martinelli’s Gold Medal tradition lives on! This limited edition Martinelli’s 1868 Hard Cider is available at various California Costco and Safeway stores. Get it while it lasts! The Dougan Family is hoping that you bring back a yearly production of your hard cider. 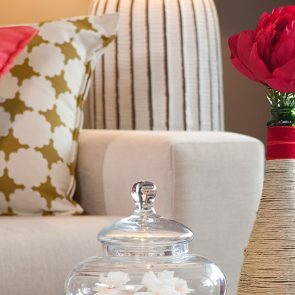 This blog informing us of the company’s history was very informative and interesting. Who ever would have thought that Martinelli was Swiss? Anyway, it is good to know that the different flavors are available all year long. As a non alcoholic drinker it is my special Christmas and Thanksgiving beverage.